Diabetics and dieters find that eating six small meals per day helps to maintain more constant blood sugar levels. 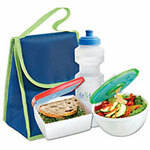 The Fit & Fresh Fruit & Veggie Bowl is ideal for storing those midmeal snacks. 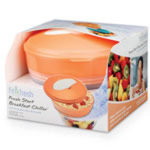 The handy plastic storage container has a convenient built-in ice pack that is designed to keep food chilled and fresh for up to 6 hours. 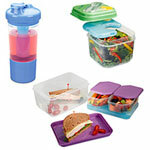 Three separate compartments separate your snack time treats. 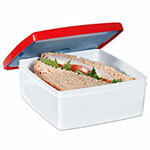 Center compartment has a lid and is perfect for storing yogurt, cottage cheese or dip. Great for portion control. Plastic bowl is top rack dishwasher safe except for the ice pack. Food can be frozen and microwaved right in the bowl. Ice pack should be removed before heating. Lunch case measures 7 1/2 in diameter. Bowl is clear with orange lids. This product was added to our catalog on Sunday 31 July, 2005.